Nothing like waking up on a day off from the job that pays the bills. That leaves me free, to work for free, for myself. Doesn’t make much sense on the surface. But there are a few perks. First off, I like the boss. Second is I set my own hours. Next I get a lot of pleasure from doing it. So far doing it has been putting words and images together in hopes I’ll say something worthwhile or provide an image that makes someone pause and appreciate for a few seconds. 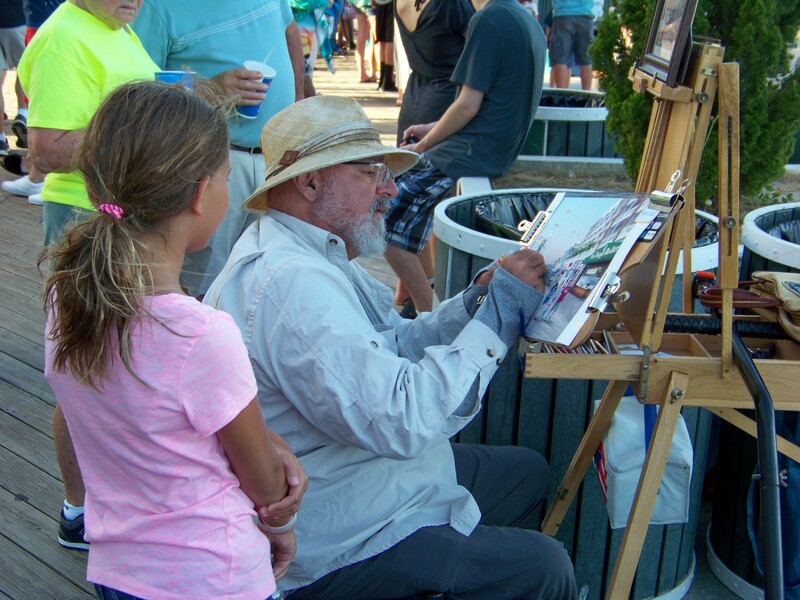 Like this gentleman painting on the boardwalk and this little girl watching him. Does she marvel at the process or the image or is she questioning in her mind why he isn’t doing it on an iPad. Or is she just taking the inspiration in, to try it on her own when she returns home? Could she be the next great artist. Sure, why not. Inspiration starts at many different points in life. Sometimes it comes and goes. Circumstances take over. Confidence ebbs and flows. Technology changes making new arts, platforms and ideas available. Just like one day, I think I’ll put something together that might make a difference. Or something that brings joy. Maybe enlightens or shows how the simple things in life can be very rewarding. Maybe in the right time or place to capture an image. Or it might be many years of work that over time builds worth and substance. Hell, if it helps me just become a little better person its been worth while. So today I hope to do some shooting and writing. I’m also going to fire up the Dremel tool and practice with that. Of course I have lots of chores and errand to fit in today, but its going to be a great day weather wise here in the state of Maryland so on with the fun and being outside. I’m really pressing myself to have random thoughts before 10am here. I have a Coke problem. You know the little red cans with the white swosh through it with that magic taste. Move the bar. To some that might mean setting ones sights higher. To others it means don’t spill the liquor. Did you ever let your mind run wild? Yeah I did that one day also, and I never got control of it again. I used to consider myself middle of the road politically. I’ve voted mostly democratic in Presidential elections but Republican on a lot of local elections. Most recently for Kittleman (county exec) and Hogan (state gov) who are republicans. This is the first time in my life I find myself tempted to just stick to a Democratic party line regardless of the individual because I’m so displeased with what I see from Republican leadership and representation in the Congress and Senate. A leader who thinks that as an individual that he is stronger and wiser than an entire country of his adversaries, is easily defeated.